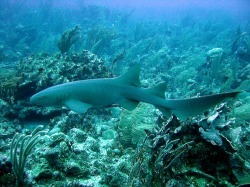 Marine Life Identification Guide in Belize - "Our Belize Vacation"
The following guide should help you identify the various marine life, that you may see while on your diving adventure tour. All of these animals are indigenous to the waters of Belize. 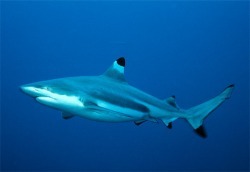 While it would be impractical to list all of the species you are most likely to see these, while diving in Belize. This section will identify some of the more common forms of marine life that you may encounter. 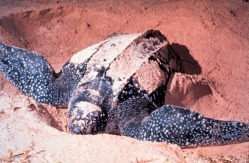 Long-lived reptiles, sea turtles do not land for any purpose other than to lay eggs. Though air breathing, they remain underwater for long periods of time. 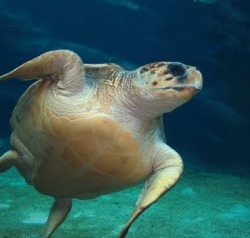 One loggerhead turtle in captivity was seen to surface for air about once every three hours. Front limbs have oarlike flippers. 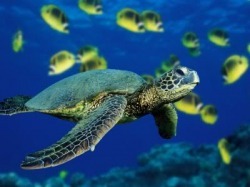 Sea turtles range over hundreds of miles in warm waters they inhabit. International agreements and the U.S. 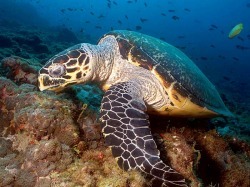 Endangered Species Act (ESA) prohibit taking sea turtles or their eggs dead or alive, or disturbing their nests. All are classified Endangered or Threatened. Leatherback turtles each from 700-1600 pounds. Seven prominent ridges run the length of the tapered, leathery carapace. 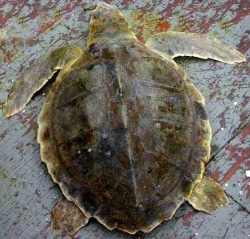 Green turtles have green body fat, which live this brown-hued turtle its name. General size range is 100-200 pounds, with a record of 850 pounds. The translucent tortoiseshell of commerce comes from the carapace of this sea turtle. Recod size is 280 pountd, but 30-100 pound is more usual. Hawksbill are set apart by harrow, hooked beak of the upper jaw. The Kemp Ridley turtle is the smallest Atlantic sea turtle, reaching a weight of under 100 pounds. The carapace is often as wide as it is long. Loggerhead turtles are reddish-brown in color i, which is the best clue to this turtle's identity. Through sea turtles are so densely encrusted with barnacles that color is obscured. Largest size is about 500 pounds, with less than 300 pounds more usual. As beautiful and repulsive as the snakes, they resemble, these fish have a smooth, scaleless skin. Narrow, muscular jaws can drive the fanglike teeth deeply into anything they grasp. The bite itself is not toxic, but the teeth invariably are contaminated with decayed food particles. Morays are generally harmless to man unless provoked. 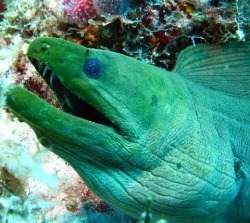 Morays should never be eaten since some are capable of causing severe food poisoning, or even death. 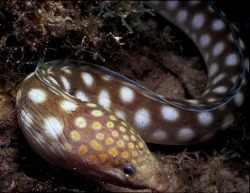 Varying in body color from a uniform brown to a densely mottled pattern, this moray may grow to four feet. 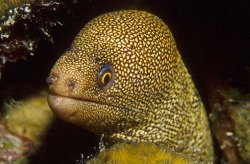 A small moray not exceeding two feet, the goldentail moray has tiny teeth even for its size. The yellow markings vary, but the golden color is most pronounced at the tail tip. 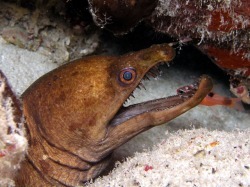 Strongly arched jaws expose the awesome teeth of the viper moray even when the mouth is closed. 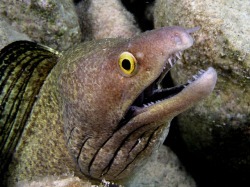 This eel ranges up to three feet long. This species reaches the greatest size of Atlantic morays, more than six feet. The green color is the result of a yellowish mucus overlaying the dark blue skin. Rays vary in form from an almost perfect diamond shape to a disk. Though often seen lying motionless on the bottom partly buried in sand, they are strong swimmers propelled by graceful undulations of their winglike pectoral fins. The mouth and gills slits are on the underside of the body, with the eyes on the upper side. 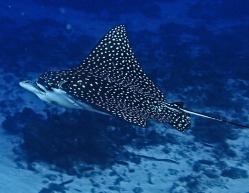 A pair of large openings behind the eyes enables most rays to draw in water for breathing without having to open the mouth. 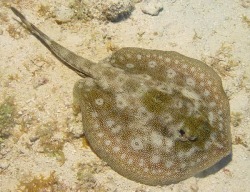 Stingrays have a serrated spine on the upper surface of the tail base, which may be venomous. This large ray (up to eight feet long) has a well-defined head set off from its pectoral fins. 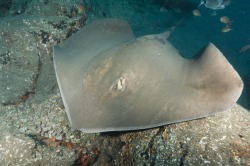 The winglike pectoral fins of this ray extend forward to encompass the head. A pale spot before the eyes marks the five-foot wide disk. 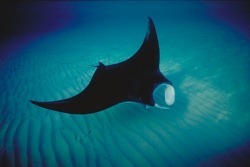 Mantas grow to a monstrous size of over 20 feet and 3,000 pounds. Unlike other rays, the mouth is in front. Limblike flaps project from the head forward of the eyes. Mantas swim with mouths open, straining food from the water. Though small, with a mottled disk no wider than 15 inches, the yellow stingray can inflict pain from its spine. Sweeping through schools of small fish, this sharklike ray feeds by slashing with its tooth-edged saw. 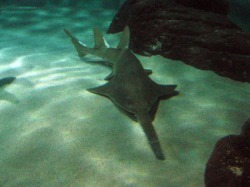 The smalltooth sawfish reaches 20 feet. Atlantic bottle-nosed dolphins are common off the coast of Belize, and research is now being done on these marine mammals at Blackbird Caye on the Turneffe atoll. 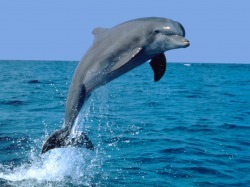 Thanks to the media exploits of Flipper, the bottlenose is the most well-known dolphin species in the world. Individuals may be gray or whitish in color and can grow up to 10 feet long. These very social animals can often be seen riding the bow wave of powerboats. 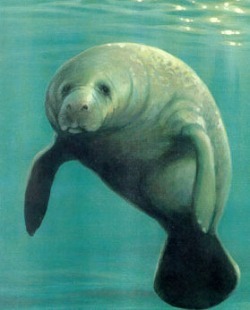 They breathe air and give birth to live young, which they subsequently nurse. The complexity of the social interactions among dolphins, scientists believe, may help explain their large brains. The creatures emit a variety of complex buzzing, whistling and clicking sounds that bounce off objects like sonar echoes and enable dolphins to "see" long distances under water. This process is call echolocation. The sound beams can apparently even penetrate living tissue, which seems to allow male dolphins to "see" when a female is approaching fertility. Dolphins travel widely and have been observed along the Belize coast in almost every marine environment, including lagoons and jungle rivers. They sometimes show up off the coast of San Pedro, Caye Caulker, Hopkins and Placencia, where they can easily be seen from the shore. A broadly rounded snout and heavy, robust body dinstinguish this shark. 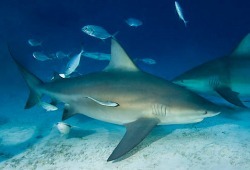 The bull shark may grow to 10 feet.